The War on Drugs is a film documentary about the war on drugs. The film shows how the war is being waged by examining the situation in Colombia and the United States. In Colombia, the United States fights this drug war by attacking the supply chain. Under a large offensive named Plan Colombia, coca and poppy growing areas are sprayed on a huge scale to eradicate the crops. However, many years of fumigation has not reduced the extent of the growing areas. In many remote sections of Colombia, the peasants have no viable alternatives to cultivating the coca plant. The coca plant is the only sustenance product there. Seven years after the start of Plan Colombia, the country exports more drugs than ever, due to expanding markets and restricted opportunities for Colombian farmers. 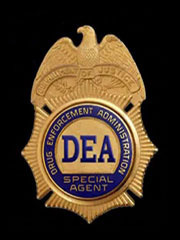 Kevin C. Whaley, Chief of International Operations of the DEA, lays out his organization's strategy. He explains why, in his opinion, the war on drugs will never end. In the United States, drug prohibition is enforced by imposing harsh prison terms for all drug law offenders. The fates of Richard Paey and Sharanda Jones show the social, political and personal implications of these measures. The War on Drugs is an analysis of a war that started almost 40 years ago and shows no signs of subsiding.